I have a theory about how one dresses stylishly in Ireland, or at least here at University of Limerick. See, as far as I can tell from a few days' observations, the thing about the Irish is that they really love their neckwear. A normal scarf is a good place to start. A knit cowl is heading in the right direction. But the truly chic will settle for nothing less than an enormous, bulky circle scarf. Ideally, it will be a chunky knit, so thick that it reaches your ears when settled around your neck and so long that you can wrap it twice and then some. (Just twice would be fine, but then you wouldn't be able to have it both tightly around your neck AND with a cascade of knitwear covering your chest, which is the ideal look.) Garter stitch and stockinette with slight variations seem to be the patterns of choice; just get as much knitting around your neck as possible. 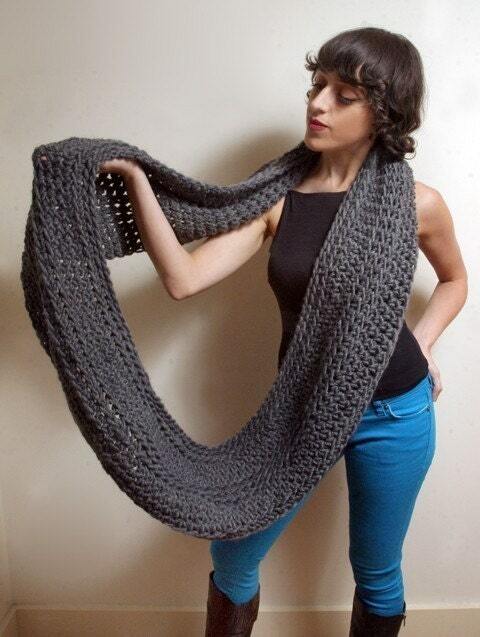 If your scarf isn't quite bulky enough, fringe is an acceptable way to add more yarn to your person. Needless to say, I will be buying yarn and making myself one of these as soon as possible. In America I usually think they look ridiculous, but after 3 days of walking to class in the constant chilly damp I'm starting to see the appeal!